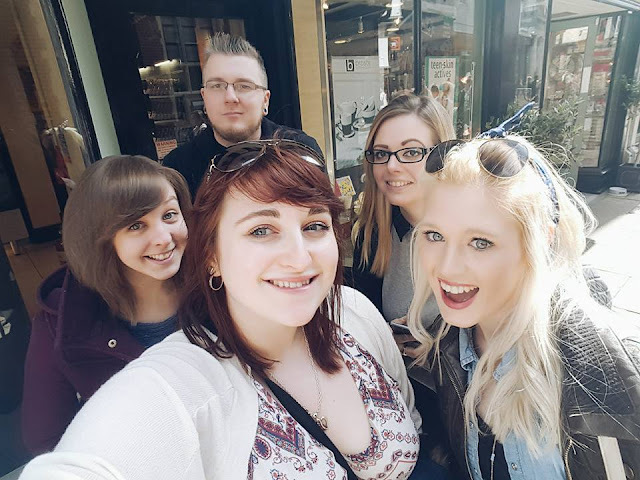 After a serious slump in my blogging and just not being able to find anything I wanted to write about, a meet up I organised in Canterbury last Saturday was the total kick up the bum I needed to get back in the flow of writing and remind myself why I love blogging. Since moving down to Kent, I've realised there is virtually nothing happening down here for bloggers. There's always loads of events and meet ups in London and up north but Kent just seems to get forgotten. So with nothing to loose I decided to organise a blogger meet up! There were 7 of us on the day, the lovely Amie from thecurvaceousvegan.com, Amanda from amandabootes.co.uk, Lu from littlebitoflu.blogspot.co.uk, Stew from tattooedowl.com, Bex from themummyadventure.com, Harry from fitnesshacks.co.uk and myself! We met up at lunch time at the Lady Luck bar in Canterbury for some lunch and there wasn't a quiet moment (until the food arrived of course!). I haven't laughed so much in ages, swapping blogging stories, Twitter dramas and sharing our tips and experiences of blogging across the years we've been doing it. From talk of Pork Pies to testing our general knowledge with some questions from a random game we found at the bar, it was like we'd all known each other years! After a good munch and 2 hours later we decided to go for a walk around Canterbury and more giggles were had. From people taking selfies of themselves in shop windows to Amanda risking eating her own shoe I honestly had an amazing time. Since Saturday I've had quiet a few other bloggers get in touch and say they'd like to come to any future events so there's definitely going to be future meets! I will keep the hashtag for the meets as #CanterburyBloggerMeet so keep your eyes peeled. Thank you to everyone who came, I had a brilliant time and you've really inspired me and gave me that kick I needed to get back into my blogging! I feel your pain! I moved to Tunbridge Wells in Kent and although it's very artsy and creative blogging was non existent. My other half works at the forum in twells and him and I are creating a bloggers event there which I think is muchly needed to bring everyone together who has a passion for blogging.